If you need to purchase one or more new iPhones from T-Mobile, you may want to do it now, as the Uncarrier has a couple of attractive deals for you. 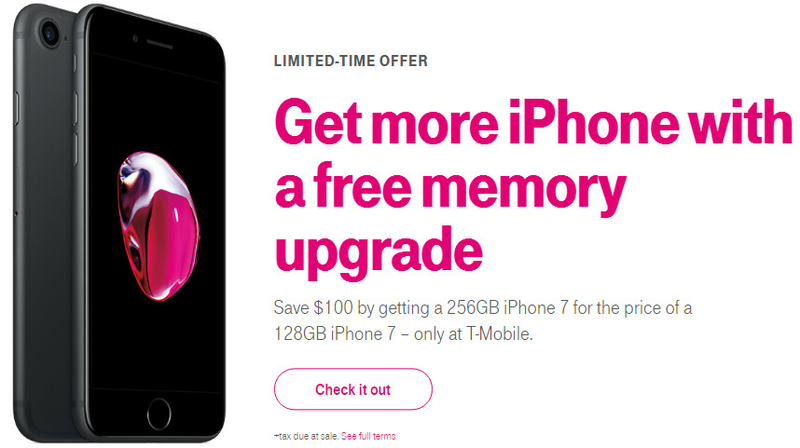 For a limited time, T-Mobile lets you buy an iPhone 7 256 GB for the price of a 128 GB model. More exactly, instead of paying $849.99 for the iPhone 7 256 GB, you'll only pay $749.99 (or $125.99 upfront, and $26.00 per month for 24 months) - this means you'll be saving $100. Unfortunately, the offer only includes the 4.7-inch iPhone 7, so it excludes the larger iPhone 7 Plus. The second deal that you can currently get at T-Mobile is a BOGO (buy one, get one free) offer. If you purchase any new iPhone model, you can get an additional iPhone SE for free. However, the first iPhone must be purchased in a T-Mobile retail location on EIP (Equipment Installment Plan), and you have to add a new line for the iPhone SE. It looks like you also have to actually pay for the iPhone SE first, and you'll receive a $400 mail-in rebate afterwards. Terms and conditions for this offer are a bit vague, but you'll certainly find more details in T-Mobile stores. So much for the incredible sales numbers. When every other flagship device on Android has QHD or sells a smaller version with full HD displays. Then Apple doesn't just look like a rip off, but is a rip off for what they are asking. Hell, even lower end Android smartphones now sell full HD displays for around the $200 mark with expandable storage and 32 GB standard. Can you tell us how much does it cost to buy an Android phone with add free services and how much is the premium insurance of the device? Oh, BTW, those are a given on the iPhone. For that price, i would rather get an HTC U11 with 128 gb plus sd card.